A tanker truck crashed and overturned around 2:00pm on Thursday. With lanes on the Beltway inner loop closed for 13 hours, traffic was backlogged throughout D.C. just before the evening rush hour. Even on alternative routes, traffic was at q far slower and far longer crawl than typically seen. The situation was made worse by the 42,000 nationals fans traveling to and from the Thursday home opener. Lanes were not reopened until just before 3:00am, with many commuters struggling to make it home on Thursday night and early Friday morning. “Clean up took all of Thursday night, finishing around 2:30 a.m. Friday, when the tanker truck was removed from the roadway. Lanes opened around 3 a.m.” WTOP reports. Throughout the night, traffic was dramatically congested at every point that cross the Potomac River, which are natural traffic choke points. 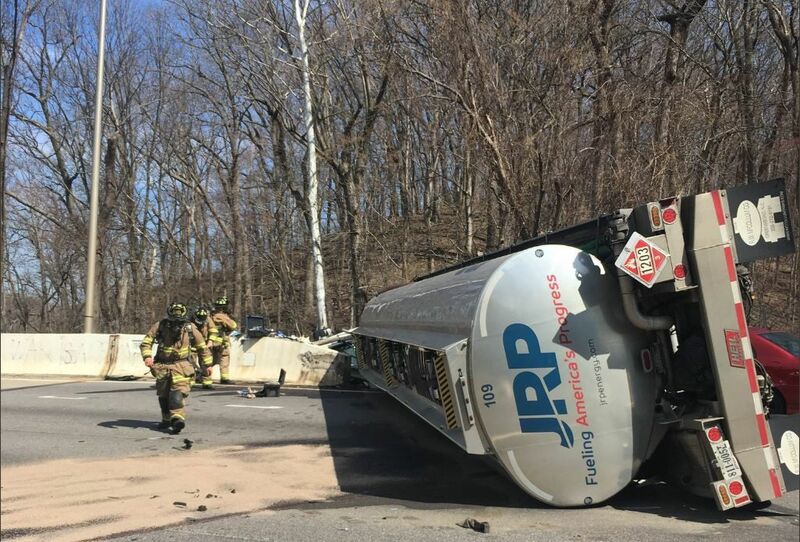 The cleanup of the overturned oil tanker was described as a “multi-jurisdictional, multi-agency coordinated complex incident scene” by VDOT and involved Fairfax County Fire and Rescue, Virginia State Police, VDOT, the Virginia Department of Emergency Management and several other agencies. Although cleanup continued early into Friday, commute times should remain normal throughout the day.